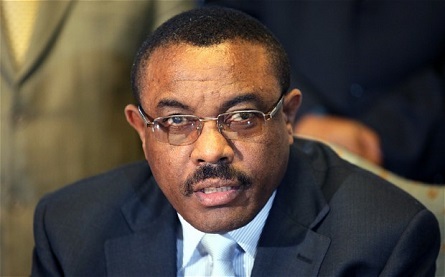 Hailemariam Dessalegn, Prime Minister of the Federal Democratic Republic of Ethiopia officially opened the 22nd Ordinary Session of the Assembly of Heads of State and Government of the African Union at the AU headquarters in Addis Ababa, Ethiopia on January 30. He did this in his capacity as outgoing Chairperson of the Union before handing over to the new Chairperson, Mr. Mohamed Ould Abdel Aziz, the President of Mauritania. Prime Minister Dessalegn announced the theme of this year’s Assembly meeting as “Agriculture and Food Security: marking the 10th anniversary of CAADP, the Comprehensive Africa Agricultural Development Programme, which is the Union’s flagship project that aims at achieving agricultural transformation in Africa. In reviewing the progress made through the program over the past decade, he pointed out that more member countries are now allocating the agreed 10 percent of their national budgets to the agricultural sector, thus contributing to the transformation of agriculture on the continent. Summing up his one-year tenure as the Chairperson of the Union, Prime Minister Dessalegn noted that a lot of ground was covered over the past year in implementing priorities to move the continental agenda forward. Among these priorities were the recognition of the historic 50 year milestone of the OAU/AU through the Golden Jubilee celebrations, the adoption of ‘Pan-Africanism and African Renaissance’ as the overarching theme in planning the post 2015 African development agenda and putting in place Agenda 2063, the blueprint for the next 50 years of the continent’s development. Highlighting the importance of adopting an African common position in international development cooperation talks, Prime Minister Dessalegn expressed appreciation for the chairmanship of President Ellen Johnson Sirleaf, and her working committee in finalizing the common African position on development priorities for consideration and adoption by the Assembly. Prime Minister Dessalegn pointed out the role that the legislative and presidential elections of last year played in helping member states come out of political crisis in countries such as Madagascar and Guinea Bissau, and the consolidation of democratic governance in countries such as Mali. The Prime Minister of Ethiopia reported that the issue of peace and security was the major preoccupation of the Union during the past year. He expressed his deep concern for the serious potential threat that the conflict in Sudan and Central African Republic poses for the collective peace and security of the region and called for continued support for the peaceful resolution of conflicts from the regional and international communities. Reporting on the work of the Commission, Prime Minister Dessalegn welcomed the adoption of the strategic plan for the years 2014-2017 and the tripartite consultative process between the UNECA, ADB and the Commission in elaborating the framework for Agenda 2063. The Prime Minister, in closing, congratulated his successor, Mr. Mohamed Ould Abdel Aziz, President of the Islamic Republic of Mauritania for assuming Chairmanship of the African Union for the working year 2014 and pledged his support.